On February 27, 2014, while surrounded by nearly two dozen African-American young men in the East Room of the White House, President Barack Obama passionately introducing his My Brother’s Keeper initiative. After briefly joking with the young students about taking the day off from school to join him, President Obama shifted to a much more serious tone to address the press and televised audience. He delved into his own troubled youth and his shared experiences with the young men behind him. However, the President began to make an important distinction between his past and the struggles of the young men behind him, reminiscing on how he was lucky enough that the environment in which he grew up stifled many of the severe repercussions of his missteps. For President Obama, policy agenda points addressing the systemic issues facing urban minority youth and communities have not moved quickly enough. His impressive electoral victory over Senator John McCain in 2008 represented a seminal point in American politics and a shattering of widely held norms. The first non-Southern Democrat was elected to the office of the Presidency since John F. Kennedy.2 A young black family now resides in the White House. Incredibly high youth and minority voter turnout and changing demographic and vote distributions were significant developments in both the 2008 and 2012 elections. I argue that these altering dynamics, in conjunction with President Obama’s personal background and experiences as well as a heightened sense of political efficacy, point toward a clear mandate for executive action in addressing urban community development issues. 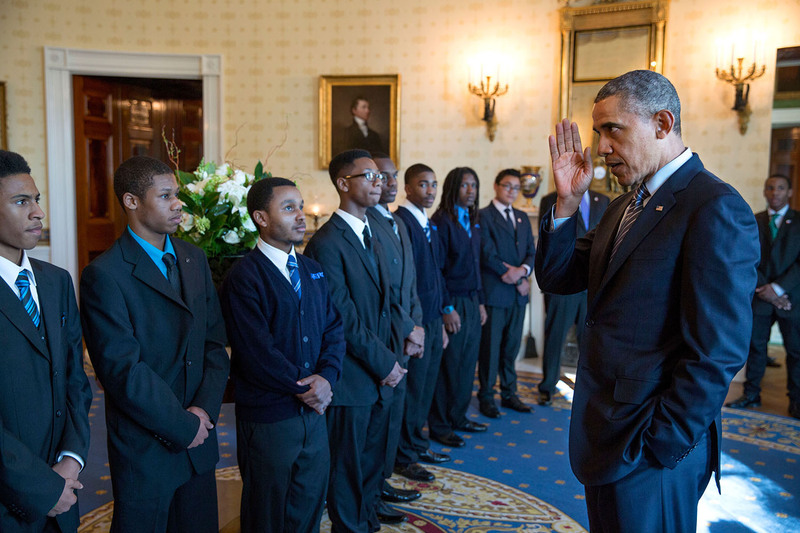 President Obama meets participants in an event to promote "My Brother's Keeper," an initiative to expand opportunity for young men and boys of color, Feb. 27, 2014. 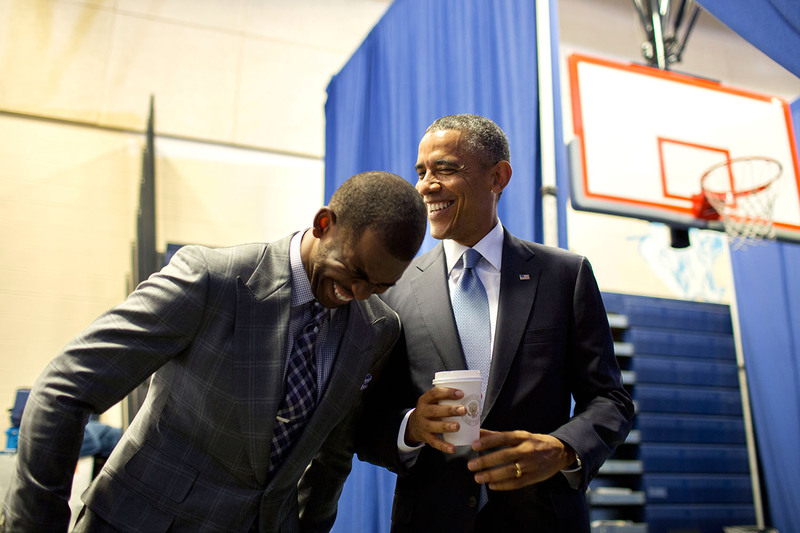 Joking with Chris Paul, who introduced the President for a town hall to promote "My Brother's Keeper, "July 21, 2014. In the context of a hyper-polarization of both political parties and a degraded economy, the first term of the Obama Presidency was largely marked by the response to the 2007-2009 financial crisis and the national economy’s recovery. Over the course of the past few years, many of the economic mitigation measures taken by the administration have proven to be successful, though certainly caveated. Solutions to concentrated poverty and the resulting intergenerational transmission of disadvantage have eluded policymakers for decades. Though the dynamics of this phenomenon have shifted slightly in the 2000’s,5 it largely remains an urban community development issue. President Obama’s background and apparent urban mandate would suggest greater attention to remediating this issue. This chapter will discuss the existence of President Obama’s urban mandate, and the growth of concentrated poverty in the 2000’s. In addition to this discussion, policy analysis of three key Obama Administration urban community development initiatives will be offered, culminating in an assessment of the President’s performance in this area of his agenda. This shift in the electorate shows a convergence of economic assets and the voice of political and policy discourse to metropolitan regions,13 and a growing complexity in the city-suburb divide not found in the traditional analysis of metropolitan areas.14 The resurgence of Washington, DC as not simply a center of government but as a global economic hub; the centrifugal growth of important business centers like Arlington, VA due to increased land-rent in the center city; accrued and increasing density expanding outward from the center with increasing regional population and gentrification of the urban core; and the declining homogeneity of the North Virginia new-town developments were all important factors in Barack Obama’s victory. Continued demographic analysis shows that suburbs are no longer the heterogeneous homes to white, middle class, nuclear families, conflicting with Robert Wood’s theories on party affiliation changes due to residential movement.15 Wood offers two key theories that once helped to explain the Republican control of the suburban electorate: conversion and transplantation.16 This conversion refers to the leaving behind of the multi-cultural and cosmopolitan characteristics of urban neighborhoods in exchange for the more homogenous, family-oriented and wealth accumulation values of the suburbs. The theory of transplantation is based on the tenant that wealth and status are reflected in home ownership. When renters move to homes in the suburbs, they have attained a certain degree of wealth and become more risk-averse and economically conservative after the commodification of their wealth and assets in the form of a home.17 The growth of diversity, both in background and income, of suburban residents over the past decade has proven to break down these theories of affiliation in favor of models that best galvanize political bases in now contentious suburban spaces. Similar to the developments in 2008, the 2012 Presidential election cycle saw an increase in roughly 1.8 million votes compared to the 2008 estimates. This increase is paired with key voter demographic changes, as white, non-Hispanic voters decreased by nearly 2 million while black and Hispanic voters increased by nearly 1.6 and 1.4 million respectively from 2008.18 Though both elections of Barack Obama displayed dramatic increases in minority voter registration and participation, the motives of these voters must be called into question to fully assess and validate President Obama’s mandate for change in America’s metros. The record-high 15.9 million ballots cast by African-American voters for the first African-American candidate for President inherently raises questions as to how large of a role racial identity plays in voter behavior. Most studies performed on black political participation have focused primarily on the psychological concepts of shared racial identity, linked fate, and empowerment.19 Though the presence of these concepts and the consequential drive for greater participation in the 2008 and 2012 election cycles likely played a role for many black voters, scholars Tasha Philpot, Daron Shaw, and Ernest McGowen argue that they are neither suitable to explain why nor assume that black voters will turnout more for the election of a black politician. Important emphasis must be given to the reinvigoration of grass roots and community organizing campaign tactics promoted by Obama For America (OFA). Formerly, scholarly models of participation in black communities followed the typified progression of, “Black candidates increase political interest among black voters, which increases a sense of shared racial identity and the desire to support someone from one’s own group, which increases voting.20” However, in the case of increasing black voter participation, breaking down the history and, if not in law, perceived barriers of centuries of racism, inequality, and segregation are more important than simply the ability to connect to a candidate because of shared racial identity. Legacies of voter repression and a lack of civic engagement continue to plague many of these communities to this day. Democratic Party and OFA officials attempted to break down these norms through aggressive voter contact to make sure voters in previous elections remained engaged in the political process by co-opting their experience and transforming it into grassroots advocacy; by developing partnerships with inner-city minority church groups, neighborhood associations, ongoing community campaigns, labor unions, as well as local and district level Democratic campaigns in order pool resources, volunteers, community leadership, and precinct-level awareness of needs and concerns; and through an emphasis on developing and directing campaign operations within these communities instead of from towering central business district consulting offices. These tactics, certainly honed during Barack Obama’s time as a community organizer in the South Side of Chicago, were certainly effective, both in terms of quantitative analysis and on-the-ground reporting. While directing a satellite field office in the Dudley Square neighborhood of Boston’s Roxbury section, I saw these tactics and results unfold first hand during the 2012 election. A retired, unionized bus driver had offered up the office space I operated out of on a month-to-month lease basis after losing his tenant after years of economic stagnation in the predominantly black and Puerto Rican neighborhood. A series of local campaigns and then OFA revitalized the once vacant storefront and brought advocacy and resurgent pedestrian life to the neighborhood’s busiest street. In my efforts, I engaged dozens of members of the community, from retired church-going women to interested sixteen-year-olds from the local O’Bryant School of Math and Science. My team and I facilitated phone banks and canvasses, giving volunteers the expressed directions to connect with potential voters on a personal level by telling them their own story and why this election mattered to them. A heightened sense of racial identity and the grass roots and community organizing campaign tactics inherent in Barack Obama’s background and personal experiences were without doubt important factors in the increased turnout rates of African-American voters. Though these factors, along with changing demographics, were pivotal in his election and his subsequent re-election, I argue that the most important factor in constructing his mandate for change in the country’s metropolitan areas has come out of a heightened sense of political efficacy. Carpenter, Daniel. "Institutional Empowerment and Strangulation." Obama at the CrossroadsPolitics, Markets, and the Battle for America's Future (2012): 33-70.
d'Addio, Anna Cristina. "Intergenerational transmission of disadvantage: mobility or immobility across generations? : a review of the evidence for OECD countries." (2007). Goldberg, Jonah. “In the case of My Brother’s Keeper, race does – and should – matter.” The Los Angeles Times, 4 March 2014. Hanlon, Bernadette, John Rennie Short, and Thomas J. Vicino. Cities and suburbs: New metropolitan realities in the US. Routledge, 2009. Ihlanfeldt, Keith R., and David L. Sjoquist. "The spatial mismatch hypothesis: a review of recent studies and their implications for welfare reform." Housing Policy Debate 9, no. 4 (1998): 849-892. Katz, Bruce, and Jennifer Bradley. The metropolitan revolution: How cities and metros are fixing our broken politics and fragile economy. Brookings Institution Press, 2013. Kneebone, Elizabeth, Carey Nadeau, and Alan Berube. "The Re-Emergence of Concentrated Poverty." The Brookings Institution Metropolitan Opportunity Series (2011). Philpot, T. S., Shaw, D. R., & McGowen, E. B. (2009). Winning the Race Black Voter Turnout in the 2008 Presidential Election. Public Opinion Quarterly, 73(5), 995-1022. Reeves, Richard. “Obama’s Post-Presidency? Tackling the Social Mobility Challenge for Black Men.” Brookings Institution Blog, 27 February 2014. Shulman, Robert. “New White House Office to Redefine Urban Policy.” The Washington Post, 3 July 2009. Wood, R. C. (1958). Metropolitan Government, 1975: An Extrapolation of Trends: The New Metropolis: Green Belts, Grass Roots or Gargantua?. American Political Science Review, 52 (01), 108. 1.) From the White House Press Release, Remarks by the President on “My Brother’s Keeper” Initiative. 27 February 2014. 5.) The concurrent increase in the phenomenon of suburban poverty is significant to note in the context of the economic recession and home mortgage crisis. Generally speaking, these suburbs are ‘inner-ring’ suburbs that have degraded over the course of recent decades with further and further metropolitan expansion outside of the center city. 6.) From the US Census Report on Voting and Registration in the Election of 2008, July 2012. 8.) Ibid. In 2008, the black voter turnout rate was 65.2% to the 66.1% rate for white voters. 9.) It is important to note the distinction between eligible and registered voter status here. Statistics from the US Census Report on Voting and Registration in the Election of 2008, July 2012. 12.) From the US Census Report on Voting and Registration in the Election of 2008, July 2012. 18.) From the US Census report on The Diversifying Electorate – Voting Rates by Race and Hispanic Origin in 2012, May 2013. 24.) From the White House Office of Urban Affairs guiding principles statement, http://www.whitehouse.gov/administration/eop/oua/about/principles, accessed on 16 November 2014. 25.) From the BLS Report on The Recession of 2007-2009, in the “BLS Spotlight on Statistics,” February 2012. 27.) Though the funding for TARP was legislated at $700 billion, the Dodd-Frank Act cut the appropriation to $475. See Carpenter, "Institutional Empowerment and Strangulation,"2012. 35.) These basic goods include things like food, car insurance, and financial and health services. The increased price in these good directly affects a number of factors that lead to poor outcomes in communities of concentrated poverty. Notably, there is a large affect on diet related health outcomes due to the fact that healthy foods options – that are often not available because quality food markets often do not locate there – are made more expensive. 46.) From the White House Urban and Economic Mobility mission statement, http://www.whitehouse.gov/issues/urban-and-economic-mobility, accessed on 16 November 2014. 48.) Shulman, “New White House Office to Redefine Urban Policy,” 3 July 2009. 49.) From the White House Office of Urban Affairs guiding principles statement, http://www.whitehouse.gov/administration/eop/oua/about/principles, accessed on 16 November 2014. 51.) From the White House Press Release, Executive Order – Establishing a White House Council on Strong Cities, Strong Communities, 15 March 2012. 53.) From the First Annual Report on the Strong Cities, Strong Communities Initiative, April 2013. 56.) Donovan, “Supporting Local Communities by Building Capacity and Cutting Red Tape,” 25 April 2013. 59.) From the President’s remarks at the 2013 State of the Union Address, 12 February 2013, http://www.whitehouse.gov/the-press-office/2013/02/12/remarks-president-state-union-address. 60.) From the US Department of Housing and Urban Development Promise Zones Statement, http://portal.hud.gov/hudportal/HUD?src=/program_offices/comm_planning/economicdevelopment/programs/pz/overview, accessed on 22 November 2014. 62.) From the “My Brother’s Keeper Task Force Report to the President,” May 2014. 63.) From the White House statement on “Getting Involved in My Brother’s Keeper,” http://www.whitehouse.gov/my-brothers-keeper, Accessed, 31 November 2014. 64.) From the “My Brother’s Keeper Task Force Report to the President,” May 2014. 66.) Goldberg, “In the Case of My Brother’s Keeper race does – and should – matter,” 4 March 2014. 68.) From the White House Press Release, Remarks by the President on “My Brother’s Keeper” Initiative. 27 February 2014.